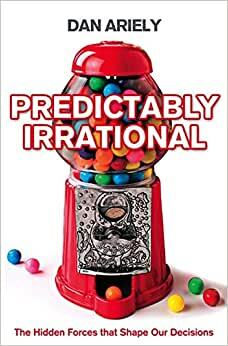 Start reading Predictably Irrational on your Kindle in under a minute. Why do we decide to behave one way or another? Economics would have us believe we are rational beings that weigh things up and decide and when wrong get tweaked back into shape by the market. Dan knows this to be a long way from how we actually behave. His book describes lots of amusing stories and tests that demonstrate just how irrational we are and how predictably we behave even when we're convinced we're rational. Very insightful and entertaining. I hope I've learned something and that knowing how I'm likely to behave irrationally will allow me to better prepare or avoid situations where I would have behaved badly (however that is defined). We'll see, I recommend you read the book for yourself, as we're all interested in ourselves to some degree and this book teaches us a lot especially in areas we thought we knew about ourselves. Learnt some interesting ways at looking at the choices we make in life, but found some of the examples and tests a bit tedious and laborious. Would have like some more concrete examples of life even famous people. This book takes you through some irrational decisions we make everyday, it will open your eyes to a new way of looking at decisions and maybe even change them. Revealing so many unexpected hard-wired responses.